My son and I were going through an old tub of cards last night and I found a shoe box with about 30 unopened rack packs and cello packs that I'd forgotten about. They ranged from the 1977 Topps to early 1990s Topps, Donruss and Fleer. Most of them had "stars" showing on top or bottom. Let's see some of your packs that show interesting player(s) on top or bottom. I don't really get too much into the stars on top but I'm a sucker for a rack pack with an error on top. Very cool -- and good catches on your part! Setting aside packs with stars on top was always easy and obvious, but I wouldn't have caught most of those errors before ripping open the packs. 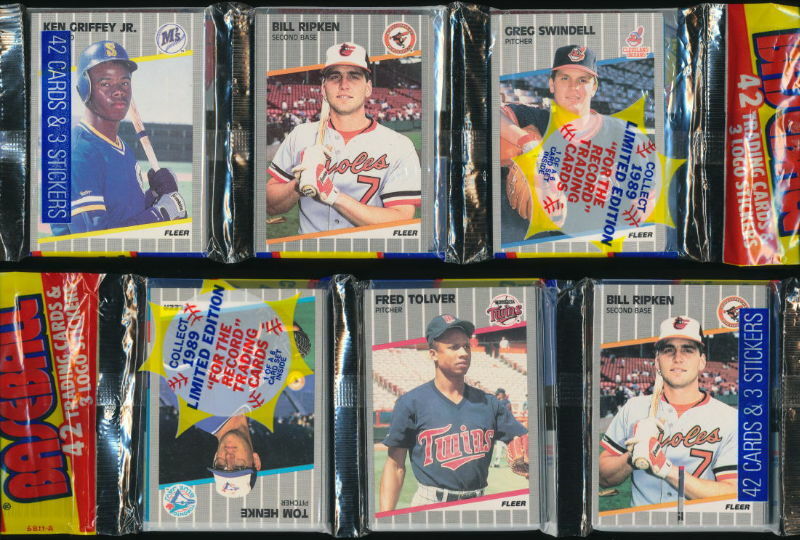 I'd love to get a pack with the Glavine/Smoltz error on top. I remember when that Juan Gonzalez rookie card was a nice pull. That 1988 rack with the price sticker makes me miss Kaybee. Pretty soon when Toys R Us goes, my toy store memories are just that. This is my only unopened rack pack. It has the semi rare Roger Clemens Blue Streak error showing in the center. I was so glad I pulled a Juan Gonzalez. Holy moly. I need to find me one of those. Great rack pack! A nice Greg Swindell and an upside down Tom Henke. Years ago I came across an 81 Topps rack pack with 2 Montanas showing on ebay. I didn't win it, but I did make a thread about it. Hahahaha. Wish I had taken a screen shot of it. I remember those...loved those kinds of packs!!! How about this one? 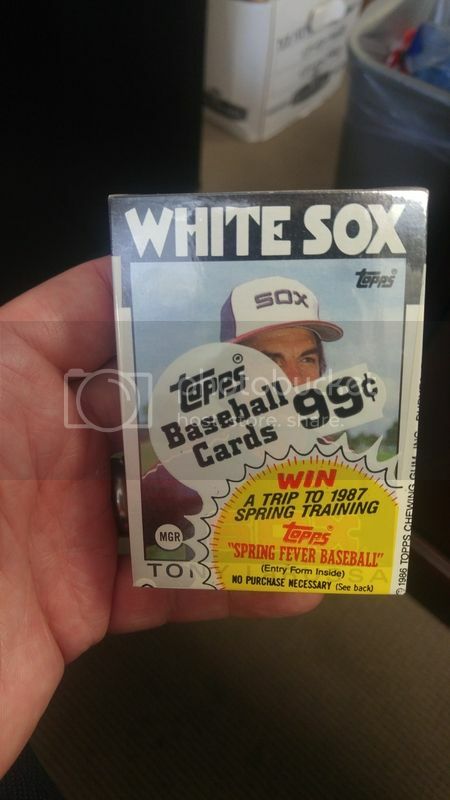 How many of you have seen 1986 Topps baseball 99 cent cellos? These bad boys have no gum and are a massive 50 cards each. And with a pretty decent manager on there to boot! Saw this one on eBay last week. Didn't win it but thought is was interesting. 42 Gary Sheffield cards? I'm not too familiar with resealed rack packs - is this possible? How about 3 HOF-ers on the same pack?